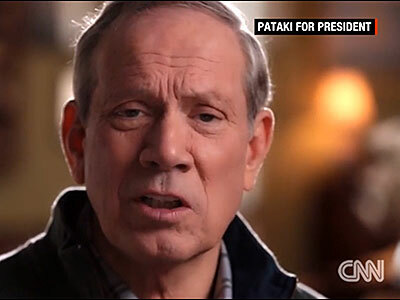 George Pataki: The Pro-Marriage Equality Republican President? He hasn't held office since 2006, but George Pataki says he's ready to be the next president of the United States. Moderate Republicans looking for a viable candidate to carry them to the White House in 2016 may have finally found their man in former New York Gov. George Pataki, who announced his presidential campaign today. Pataki now stands out as the only major Republican presidential hopeful who supports marriage equality. As Politico noted, that stance, his moderate positions on gun control and the environment, and his nine-year absence from political office "make him an afterthought with much of the party's conservative base." “We are the party of the middle class,” Pataki declared today, sweating profusely as he stood in front of the red and white stripes of a huge American flag in Exeter, N.H. “Unless by 'middle class' they mean someone who left the White House dead broke and 10 years later had a hundred million dollars,” he said, drawing laughter and applause in a thinly veiled shot at the Democratic front-runner, Hillary Clinton. After a decade leading the state of New York, Pataki disappointed speculative pundits who twice hinted that he might run for higher office. But today Pataki finally did just that, joining a field of at least 17 declared candidates seeking the GOP nomination. "My vision was not a partisan vision. It was a vision about people, about what we could accomplish together," Pataki said in the narration of a four-minute announcement video released this morning. "If we are to flourish as a people, we have to fall in love with America again." Pataki didn’t clarify if that love includes LGBT people in his announcement video, which is branded with the slogan "People Over Politics." But Pataki did offer a passing mention of gay people in a political advertisement that first appeared in mid-April, where the former governor laid out his presidential priorities: "Defeating Islamic terrorists, shrinking government, growing the economy — these are the issues that matter most," he said. "Instead we're debating social issues like abortion and gay rights." He called that a "distraction." CNN reports that Pataki and his aides have telegraphed that he plans to run as an outsider, naming the super PAC supporting his bid as "We the People Not Washington." In announcing his bid today, Pataki railed against the political class: "You are our servants, not our masters," he said. The video also proclaims, “His leadership inspired people of all backgrounds, factions, and beliefs to come together and work towards a better America.” But The Advocate counted only three African-Americans among the many white faces, and they appeared only in file photos of Pataki from a decade or more ago. All of the other people Pataki can be seen courting for support in the video are Caucasian senior citizens, with the exception of one brief scene of him chatting with a Latino man and another nonwhite man. Pataki was elected governor of New York three times but declined to run in 2006 for a fourth term; Democratic Attorney General Eliot Spitzer succeeded him, then resigned amid scandal. There was rampant speculation that Pataki would seek the presidential nomination in 2008, and again in 2012. “[Pataki] has impressed party activists in New Hampshire and fundraised well during his time in New York. The former governor is betting it all on the Granite State, whose more moderate electorate is better-suited for his approach than the more conservative voter blocs in Iowa and South Carolina.